Have you always dreamt of having a stunning, contemporary and clean-lined wet room in your own home? A stylish and modern haven in which to retreat after a hard day's work? Well, your dream of the perfect wetroom may be more of a reality than you first thought. At MBD, we can help you create your ideal wet room at a cost that is much more appealing than other bathroom companies, meaning that you can have the wetroom of your dreams, without breaking the bank. A wet room is a waterproofed, tiled room with a walk-in, barrier-less shower which enables the user to simply walk into it, and a more and more popular option in modern and spacious homes. 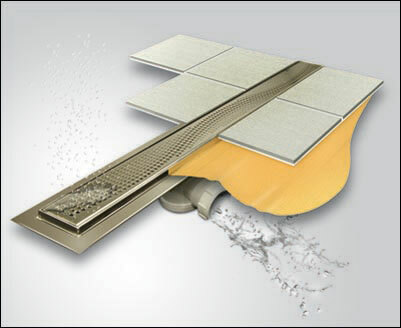 The shower drain is inset into the wet room floor, which is set at a slight gradient to allow easy drainage. However, when installing a wet room, it is essential that you have good drainage to ensure that your wet room remains a place you want to retreat to, not from! This is where ACO can help. The fantastic range of ACO wet room drainage solutions is extensive and varied, including stainless steel modular channel systems, stainless steel EuroGully gully systems, stainless steel and polymer composite access covers, biological grease management systems, gravity grease separator systems, anti-flood protection valves and stainless steel socketed pipe systems. ACO Building Drainage is a division of ACO Technologies PLC, and specialises in corrosion resistant drainage systems and building products. ACO's range of fantastic drainage solutons for wet room floors is impressively effective, offering the user a memorable and pleasurable showering experience, complete with total peace of mind with regard to quality and performance. ACO wet room drains are of an exceptionally high standard of quality and offer longevity and performance that is hard to beat. ACO achieves this level of excellence through the use of high performance materials, expert design experience and project support, as well as a global manufacturing capacity. When choosing your ACO drainage solution for your wet room, you can choose from an ACO shower channel or an ACO shower gully. Both offer exceptional quality and design standards, and will prove an attractive and effective addition to your ideal wet room. All ACO wet room drainage solutions are easy to install, maintain and clean. Constructed from stainless steel, these ACO drains are easily cleaned with soap or a mild detergent and warm water, followed by a rinsing with clean water. Here at MBD, we can supply you with all you need to create the perfect wet room. With wet room kits to fit any sized room, and drainage solutions to suit, let MBD and ACO make your dream come true. Customers can rest easy in the knowledge that their wet room floor drainage solutions are of the highest quality, as ACO is quality assured in accordance with ISO 9001-2000.